Posted by V the K at 9:41 am - March 23, 2015. Ted Cruz announced he is running for president, which comes as a surprise to no one. I like Ted Cruz a lot, but I am wary of ideologically driven men who run for president before completing a single term in the senate. That has never worked out well for us as a country. The Democrats are attacking Ted Cruz as the architect of the Government “shutdown” that they claim “cost the economy $24 Billion.” To me, and others who can process information in a rational way, this actually makes the case for Ted Cruz or someone like him. When Democrats make the attack that Government spending is necessary to sustain the economy, they are admitting that the economy is dysfunctional. If the economy requires trillions of dollars in deficit spending to keep from collapsing, something is deeply wrong with it. And if you think that constantly running up Trillions of dollars in debt is a sustainable economic model, I know an adult pre-school in Brooklyn who will gladly accept your Visa card. Posted by Jeff (ILoveCapitalism) at 12:01 pm - June 4, 2014. Stella Creasy, the Labour & Co-operative MP for Walthamstow, said that Britain either needs immigration or a massive baby boom in order to support the growing number of pensioners, or else “our ability to sustain our economy” will collapse. She added that this would leave the NHS in crisis. Perhaps her horror at the thought of women “like her” needing to have children feeds into the horror that UK establishment parties feel about the rise of the UK Independence Party? She said that this made UKIP leader Nigel Farage “deeply unpatriotic” as his party has campaigned for an end to mass immigration. UKIP are “basically talking about managing the decline of Britain” she said. And it is true that UKIP voters believe that Britain needs tighter border controls. But does that make them “deeply unpatriotic”? Perhaps over-the-top name-calling is a tactic of the Left in the UK, as well as in America. In reality, the UKIP stands in a libertarian-Thatcherite tradition; hardly unpatriotic, and not even very anti-immigrant. Its leader, Nigel Farage, has explicitly said “We’re not going to join in with extremist-nationalist groups” in the European Parliament. To the extent that Farage is required to ally with parties from other countries, he prefers Beppe Grillo, the comedian who leads Italy’s anti-establishment 5-Star movement. Which brings us to the point. To its great shame, the UK’s Conservative Party *is* now going to work with parties that it calls “unacceptable”, against Farage and the UKIP. Because the Conservative establishment is that frightened of Farage’s upstart movement, or of any effective challenge to Big Government. I am reminded of nothing so much as how the Republican establishment treats the Tea Party (i.e., stab them in the back whenever possible, and even if it means betraying principles). It’s a sad moment for the once-great party of Winston Churchill and Margaret Thatcher. Posted by V the K at 8:10 am - March 10, 2014. Ted Cruz’s performance at the annual Gridiron Dinner apparently went well. Canadians are so polite, mild-mannered, modest, unassuming, open-minded. Thank God my family fled that oppressive influence before it could change me. I might add that Canadians are also extremely efficient. No red tape at all in handling my application to renounce citizenship. They had that thing approved before I even sent it in. The simple truth is that for a very brief time my family lived on the plains of Calgary. That does not make me a Canadian. Although Elizabeth Warren says that it does make me an Algonquin Indian. Of course, my family is Cuban… At first, when he got here, my dad washed dishes for 50 cents an hour. He was so low on the totem pole where he worked that even Marco Rubio’s father bossed him around. Kind of reminds one of Reagan, don’t you think? Posted by Jeff (ILoveCapitalism) at 10:01 pm - March 8, 2014. Rick Perry on why Red States do better than Blue States. Rand Paul. “You may think I’m talking about electing Republicans. I’m not. I’m talking about electing lovers of liberty. It isn’t good enough to pick the lesser of two evils.” And it gets better from there. Sarah Palin. “There’s no free ride. Someone always pays. And if you don’t know who that someone is, it’s probably you.” – And too many other zingers to count. I love this woman! That’s all I could watch in one sitting, while fighting my cold. Here is the full playlist; if you have a favorite, call it out in the comments! Posted by Jeff (ILoveCapitalism) at 12:58 pm - February 26, 2014. My title (point) will strike most people as obvious. But some “obvious” things remain theoretical until they hit you. Then they feel almost like a new thought. I’ve been on a break from “the news” for over 2 months now, and I feel relaxed. Life is easier this way. What Obama and the Democrats have been up to, by way of destroying most of what has been healthy and good about America, is so sad. And out of my control, so it’s easier to think about other things. This may lead to a small insight into the “low-information voters” who support Obama / Democrats. Politics deals with life-and-death questions. A budget or regulatory change can force any number of people into changing their lives. ‘Not thinking about it’ is probably easier for most people, including those voters. The average Democrat voter (that I’ve encountered) has a feeling that the Democrats seem to like abortion privileges, gays and blacks; and she likes those things, too; and she doesn’t think any further about politics, because she figures that whatever else the Democrats are up to, she would probably also like. Never mind that in reality, the Democrats are the stalwarts of that Big Government – Big Banking nexus which siphons off her earning power year after year, and whose nature is essentially fascist (anti-freedom). What’s depressing for libertarian-conservatives is that the Republicans are only a little better. The GOP are better – as in, usually they are a bit less insane. But the GOP Establishment are also captives of (or intimidated by) the same Big Government – Big Banking nexus that uses/runs the Left. The GOP and Democrat establishments unite in seeking to destroy the Tea Party – who are the main people interested in a smaller government, to restore the prosperity and freedom of Americans. Posted by Bruce Carroll at 3:25 pm - January 28, 2014. For your pre-State of the Union pleasure. Posted by Jeff (ILoveCapitalism) at 9:00 pm - October 15, 2013. I’m sick and tired of people who say that if you debate and disagree with this administration, somehow you’re not patriotic. We need to stand up and say we’re Americans, and we have the right to debate and disagree with any administration. Oh wait, did I say that? Or some jihadist American Taliban terrorist bomb-throwing hostage-taking TeaBaggerParty Ted Cruz-loving anarchist wingnut grandmother, maybe? No, it was Hillary Clinton saying it about an earlier administration that was quaintly civil to its critics, compared to the present one. K Street vs. Tea Party: the GOP’s real civil war? Posted by Jeff (ILoveCapitalism) at 12:57 pm - October 10, 2013. Interesting piece from Timothy P. Carney / Washington Examiner, Tea party loosens K Street’s stranglehold on the GOP. While GOP leaders backed candidates like Charlie Crist (Fla.) and Trey Grayson (Ky.) in 2010 primaries, the SCF backed Marco Rubio and Rand Paul. K Street and the National Republican Senatorial Committee worked hand-in-hand — but for a change, there was a countervailing force. The Club for Growth was Paul’s biggest source of funds, giving him $105,000…[SCF] kicked in $36,685. These two groups, together with FreedomWorks, also spent big on independent expenditures for Paul. Ted Cruz also came to Washington by defeating K Street. The Club for Growth spent more than $2.5 million helping Cruz in the Texas GOP primary, while the SCF spent about $800,000. K Street was backing Lt. Gov. David Dewhurst — he got $500,000 from business PACs (33 times Cruz’s take), and GOP lobbyists hosted a fundraiser for him at the Capitol Hill townhouse of Democratic superlobbyist Tony Podesta. A Republican who doesn’t care about Bank of America checks wasn’t possible before the Tea Party. I’m not going to [negotiate] until the more extreme parts of the Republican Party stop forcing John Boehner to issue threats about our economy. First, remember that Obama is the one issuing threats about our economy. But his comments reflect that the Tea Party, because they want to actually halt the growth of government spending and change the Washington spending game, are an existential threat to Obama’s “Big Government” brand of politics. 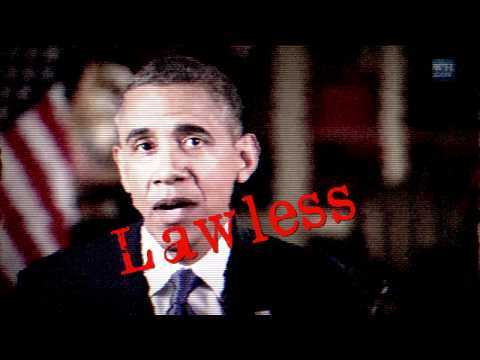 And so, Obama wants the GOP to expel them and go back to Washington’s business-as-usual. They’re all in it together. The Democrats are 100% Big Government; the GOP are less so, but nonetheless have an establishment (K Street) which is fairly Big Government and 100% dedicated to playing the Washington game. Our freedom is at stake. Ted Cruz and the GOP so-called “bomb throwers” protect it. Hat tip, DrewM at Ace for airing Carney’s article. Posted by Jeff (ILoveCapitalism) at 12:02 pm - October 5, 2013. 1995 shutdown: the Lincoln Memorial kiosk is closed, but people can still visit the good Mr. Lincoln. 2013 shutdown: Lincoln is barricaded. The public is rebelling against these barriers, which are starting to be called “barrycades” or “barackades”. Legal Insurrection has a piece on America’s veterans removing the barrycades from the Vietnam Memorial. WND has video of a tourist (rightly) crossing the Lincoln barrycade, and being escorted away by a guard. In the 1995 shutdown, Congress passed numerous stopgap measures to keep government services running. In 2013, the House is passing such measures again; but Senator Reid, President Obama and other Democrats won’t allow them. Your Democrats: Holding America hostage. Which leads us to the latest example of left-wing projection. Since the Left is actually holding America hostage (by ostentatiously denying certain programs or public facilities until they get their way), they try to say it’s the other guys doing it (GOP, Tea Party, etc.). We’ve seen it in comments at Gay Patriot. The ante got upped a few days ago by Obama himself, who said the GOP is “trying to put a gun” to his head. Of course he would say that because, again, the Left always projects. But the facts show Obama and the Democrats holding the gun, to the rest of our heads. Posted by Jeff (ILoveCapitalism) at 8:35 am - September 10, 2013. Via The Blaze and of course, YouTube. Posted by Kurt at 6:07 pm - June 8, 2013. Wow, just wow, is about all I can say in response to this piece of leftist rationalization which I saw today on Facebook. It goes without saying that we’d be hearing something VERY DIFFERENT from this fellow if there was a Republican president. Global warming. The richest 1% controlling more wealth than the bottom 50%. Homelessness. Gutting the food stamp program. The rich hiding several Trillion untaxed dollars. Secretaries paying more in taxes than billionaires. Politicians being bought and sold. Malaria and starvation. More people per capita in prison than any other country. The “war” on drugs. More black men in prison than in college. Rising cost of education and health care. The rise of extremism. The continued oppression of women. The general lack of compassion in the world. The degree to which we all blame our problems on others and close our eyes to our own irrationality. That more people are outraged by a small loss of privacy than any of these other issues. Should I add “People who write in sentence fragments” to his list of outrages more “worrisome” than a government which spends all its time monitoring its people, or is that just my pet peeve? Posted by B. Daniel Blatt at 8:02 pm - June 5, 2013. Posted by B. Daniel Blatt at 3:30 pm - June 3, 2013. 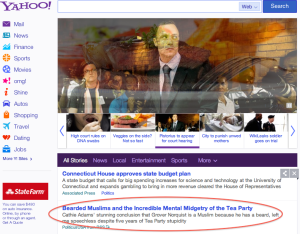 Earlier today on Yahoo!, we saw another headline manifesting the mindset which made Michele Bachmann the media face of the GOP and Tea Party. Now, although Mrs. Bachmann was an elected public official, she was neither a leader among her congressional colleagues nor successful in her attempt to break into double digits in political caucuses with real consequences in the GOP presidential contest. The crap the Tea Party peddles is nothing new. The ideas behind the Tea Party are nothing new. The world has been plagued by mental degenerates since the dawn of time and we might as well accept that demanding cogent arguments from them is going to change anything. This was little more than an angry rant dressed up as an opinion piece. By this writer’s methodology, we should define contemporary liberalism by the mean-spirited signs hoisted at San Francisco rallies, imagery which Zombie routinely posts on pjmedia. What did David Axelrod know and when did he know it? Posted by B. Daniel Blatt at 12:18 pm - May 15, 2013. “To believe“, Bruce tweeted last night, “that no one in @BarackObama White House knew about IRS scandal is to, in words of @HRClinton ‘willingly suspend disbelief’.” Perhaps, I was in too generous of a mood last night when I read that, aware that there was as yet no evidence linking top Obama officials to the scandal. Though given the information asked of Tea Party groups — and the fact that the IRS was approving liberal groups while leaving Tea Party ones “in limbo”, it is pretty clear that some political appointee had a say in that. Once again, who decided to ask for all this information from the Tea Party folk? Seems the IRs was interesting not just in gleaning information about the organizations, but also about learning the names of citizens participating in the organizations. Why would they need know the names of all the group’s members and its donors? Was their goal to get those names? And for what end? Seems there was more to this than just string out the process. UPDATE: Even the names of high school and college kids? UP-UPDATE: Sounds like David Axelrod is acknowledging Obama’s incompetence, the president’s unfitness to preside over the executive branch? UP-UP-UPDATE: The answer could be nothing and never, but one’s gotta wonder how Obama’s political allies manage to get copies of confidential forms his ideological allies filed with the IRS. IRS targeting the Tea Party: really a surprise? Posted by Jeff (ILoveCapitalism) at 2:30 pm - May 13, 2013. Senate majority leader Harry Reid likening the Tea Party to “anarchists”. Semi-retired Congressional dumbass Barney Frank claiming that al Qaeda and the Tea Party are “aligned”. The New York Times accusing Tea Party-inspired Republicans of “economic vandalism” for opposing debt ceiling increases, the very stance that then-Senator Obama took famously in 2006. Other editorialists also referred to “hostage taking” and “terrorism”, or even called the Tea Party “totalitarian”. Media coverage in general showing great bias against the Tea Party. Some note that the media ignored real union violence, while covering imaginary Tea Party violence. The media repeatedly trying (and failing) to link the Tea Party to each new mass killer, such as: the Boston Marathon bombers, the Gabby Giffords shooter, the Aurora shooter (wherein ABC rushed to blame a certain Colorado Tea Party activist), the guy who tried to crash a plane into the IRS building in Austin (but who proved to be left-leaning), and more. Given the climate of bias, hate and fear that our top leaders and media have sought to foment against the Tea Party for years, is it any wonder that self-important IRS bureaucrats would act unethically toward it? UPDATE: As long as my list is, I know that I’ve missed some juicy examples of our top leaders and media fomenting bigotry against the Tea Party. Please feel free to add more in the comments. UPDATE: Rick Santelli points out the logical endpoint of the IRS’ approach – namely, your Obamacare death panel Accountability Board saying “No stent for you!” based on your politics – and predicts that Obamacare will be altered partly to prevent such a nightmare. UPDATE: How could I not mention how they’ve also tried to link the Tea Party with racism? Latest example: a top NAACP leader claims that America’s racist Taliban deserved the IRS scrutiny. Posted by Kurt at 12:08 am - February 9, 2013. In his post yesterday about the Los Angeles shooter, Jeff pointed out the noteworthy lamestream media silence on certain key elements of the shooter’s manifesto. Indeed, as Noah Rothman notes today at Mediaite: When crazed shooters can’t be linked to the Tea Party, the media displays admirable restraint. The story of the shooter in Los Angeles, in fact, is–like several other recent shooters–only of interest to the press corps to the extent that it helps feed the narrative about “gun violence” and the need for more gun-control. Elements of the story that don’t fit with the narrative are omitted, and especially those elements that contradict the narrative or help to fuel competing narratives. Because the Los Angeles shooter’s manifesto complains about perceived “racism,” this could theoretically turn into a story about how the racial grievance industry has created a monster, but of course it never will because that is not an agenda the media has any interest in promoting. Other common themes of note these days include the repeated focus on “bullying” as a way of pushing “anti-bullying programs” and “anti-bullying” legislation. Hence, this horrible story is of interest to the media because it is seen as a way of advancing the “anti-bullying” agenda. In years past, it may have been reported simply as a brutal fight in a school yard, but not any more. I’m curious to know more about the attacker, but the story doesn’t tell us, nor does the journalist who wrote the story have any interest in reporting what the actual issues in this case are, because doing so would only undermine the “anti-bullying” agenda. Even NFL cheerleaders are of interest largely to the extent that they can help advance the cause. And of course, gay issues are another big agenda item for the press corps, but only insofar as gays and lesbians can be portrayed as either victims (of hate or discrimination or abuse) or as inspiring and selfless humanitarians. Hence, this story about a supposedly “gay” dog in Tennessee was picked up by the national press because it helped advance the narrative that people in “red states” are stupid bigots who hate gays; in truth, it is really a story about how there are people in all states who shouldn’t own dogs either because they are irresponsible and self-centered or because they have no knowledge or understanding of normal canine behavior. Had the dog been euthanized after having been abandoned by a gangster or a meth addict in the inner city, you can be certain it wouldn’t have made the news. Posted by Kurt at 12:26 am - February 1, 2013. The first post in my ongoing, periodical series about “social liberalism” generated a lively discussion (which was still continuing last time I checked). I had originally planned a second post about the implications of the socially-perpetuated nature of liberalism on both the arguments (or lack thereof) and pundits that seem to dominate on the left side of the political spectrum. I still think that’s a fascinating topic, and I plan to write more about that in the future. The Stickiness Factor? That’s what it sounds like: it’s a message that doesn’t just amuse or intrigue people for a mere minute. Instead, it sticks with them and, even more importantly, makes them act. During the Bush years, the Dems came up with a great one: No War for Oil. The fact that this slogan had little relationship to the facts, or that a ginormous number of people stuck it on the back of their gas-guzzling SUVs was irrelevant. Those four words convinced too many Americans that the Republicans were fighting wars on behalf of Standard Oil. The Progressive penchant for ignoring facts undoubtedly makes it easier for them to come up with the pithy slogans and posters that sweep through Twitter, Facebook, Google+, and email chains before ending up on tens of thousands of bumper stickers that subliminally drill into every driver’s head. People could laugh when reading “Somewhere in Texas, a village is missing its idiot,” never mind that George Bush was a highly educated, accomplished man with an academic record better than or equal to his opponents’. Conservatives used to have pithy sayings (“Live free or die,” “I regret that I have but one life to give for my country,” “That government is best that governs least”), but we don’t seem to have come up with any clever ones lately. As you may recall, during John McCain’s failed candidacy, his slogan — “Country First” — managed to leave supporters cold, while allowing opponents to mumble about racism. I doubt that we’ll ever get another “I like Ike,” but we can certainly do better than Romney’s “Believe in America,” which sounds more like the beginning of a fairy tale than it does a rousing call to the ballot box. And finally, there’s the Power of Context, which at its simplest level means that a message has to capture the zeitgeist. People have to be primed and ready to receive the message. In 2012, Americans, fed on decades of anti-capitalist education and entertainment, were more than ready to believe that Romney was a dog-abusing, woman-hating, religious nut who wanted to enslave poor people and blacks. Thirty years ago, people would have laughed at this message. Last year, there were too many people who thought it made a good deal of sense. Conservative thinkers may have some level of disdain for the demagogic nature of most political slogans, but one can’t deny their force or their effectiveness. People on the left, for instance, love to make assertions about “social justice,” “sustainability,” and lately “gun violence” which rarely stand up to close scrutiny, but the mere application and repetition of the terms is usually enough to persuade a certain sector of the population that these must be serious ideas deserving of merit. Bookworm argues that conservatives need to focus more on generating catchy and timely messages and that doing so will help advance our ideas more effectively. I think it’s a great point. Conservatives are certainly capable of it: the early Tea Party rallies were filled with all kinds of clever signs and slogans, but the creative force of that movement seems to have dispersed lately. How can we reignite it? Posted by Bruce Carroll at 1:06 pm - January 22, 2013. This piece was originally posted by my good friend Billy at the Charleston Tea Party webpage and at RedState. It is re-posted here in full. New US Sen. Ted Cruz (R-TX) hits the nail squarely on the head in this piece for the Washington Post. The Republicans MUST become more effective at presenting the idea of the opportunities that conservatism provides. The GOP no longer needs to be known as the Grand Old Party, but the Great Opportunity Party. Our principles of limited government, personal responsibility, and a desire to make tomorrow better than today, are what make us uniquely qualified to address our nation’s challenges in the most productive manner. We MUST become salespeople of conservative ideals. What is the opportunity that the GOP provides? We have a belief in the power of the individual to improve their own lot in life. We understand that it is hard work and a desire to learn that allows people to invest in their future. We KNOW that America and our founding principles are what continue to make America that “shining city on a hill” that John Winthrop spoke of as he reached the shores of this great land. I believe that we are at a time for choosing, and we must do as Reagan said, ““Four years ago we raised a banner of bold colors – no pale pastels. We proclaimed a dream of an America that would be a ‘shining city on a hill’.” We’re talking about the same bold colors today – crafting a message of opportunity and then communicating that message eloquently, forcefully, and without apology. We offer a spirit of entrepreneurship. This idea is not only confined to those that own their own business, it applies to everyone as they seek to do their job to the best of their ability. I remember a store manager early in my career said to me, “Billy, in order for us to be successful, we need to run it like we own it.” He meant to take pride in the job that I did, and if I took ownership of the job I was assigned, I would be rewarded. This lesson paid off, as a short period of time later I entered the management training program. I continued to carry that philosophy throughout my time in the grocery business, and continue it today as I have a small business of my own. Any person can be an “entrepreneur,” whether it is the men and women that keep the office clean, the folks that make the products we use everyday, or the people that take care of us when we go out to eat. Anyone that takes pride in their job, and seeks a way to improve, is an entrepreneur. We know that personal responsibility is essential to success. When you play by the rules and work hard you CAN succeed, however a burdensome government can often make this more difficult. The wages that people earn should not be used to bail out irresponsible business owners and others that have made poor decisions. The ability to fail is essential to success, I have learned far more from my failures, than I learned from my successes. If that opportunity to fail was not there, I would never have learned those valuable lessons. When people make bad decisions in business, they need to be allowed to fail, so that we all may learn these lessons to ensure success in the future. It is much better to learn not to touch a hot stove by watching someone else burn themselves, than putting yourself through that pain. We have many other reasons for why we truly are the “Great Opportunity Party,” and this is just a start. I challenge each of you to think of ways that opportunity can lead to success, and to become salespeople of these ideals. Change begins at home, and I hope many of you will join us in this fight. We must shout our message from the rooftops, and liberate everyone from the “soft bigotry of low expectations.” We can continue to ensure that America remains that “last best hope for mankind,” but it will take all of us working towards a common goal to get there. Posted by Bruce Carroll at 4:53 pm - December 17, 2012. I didn’t want the post below to be the lead item on what is a very historic day for my state. So I want to add some brief personal thoughts about Tim Scott. He is an awesome pick. Unlike most of the politicans who embraced Tea Party, limited government principles AFTER the movement forced them to, Tim Scott already possessed those principles. He is a smart, funny, engaging guy who has a way of making everyone around him feel included. I daresay that he will rival some of the more notable Senators as one who will go into the history books based on his record and accomplishments. I had the unfortunate pleasure to follow US Rep. Tim Scott at the October 18 Charleston Tea Party rally. He had the crowd on its feet, singing and full of energy; he was a hard act to follow. It is worth noting that Tim Scott is the only black Senator from the Confederate South since Reconstruction. And the only black Senator from the South since the 1964 Civil Rights Act passed. Only Illinois and Massachusetts have had African-American Senators in modern America.